On a frigid February night in 1963, petty thief and recent prison escapee Rocco Balliro embarked on an ill-advised rescue of his girlfriend Toby. She had set out that morning to seek a divorce from her husband, who hours before had gained release from jail. When he failed to hear from her, Rocco and a pair of associates armed themselves and launched a search to locate Toby whom he believed was held against her will by her estranged husband. Storming the darkened apartment on the outskirts of Boston where he thought he’d find Toby, Rocco and his sidekicks were suddenly embroiled in an ambush. Searing bullets ripped through the tidy home, impacting with furniture where hours before, children had joyfully played. Unbeknownst to Rocco, he was not engaged in a gun battle with Toby’s husband but rather, several Boston Police officers, who had devised an unsanctioned sting operation to apprehend their wanted man. Rocco and his gang took flight and a car chase commenced as additional police joined in. Rocco managed to elude his pursuers but before long discovered that his beloved Toby had been in the apartment and was killed, along with her toddler son. He gathered that she and little Mark had been caught in crossfire as the inept police resumed firing in the darkness, soon after Rocco had fled. Distraught, Rocco surrendered to authorities to face charges. 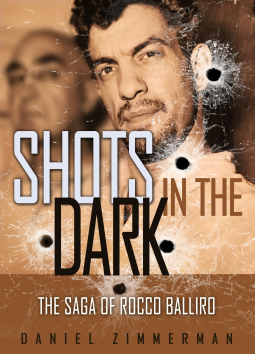 What followed was fifty years of incarceration, two escapes, two marriages, and Rocco’s exhaustive attempt to prove his innocence.